Now more than ever before healthcare organizations have the ability to transform the patient experience through the use of Apple technology. Whether you've been using Apple for years or are just beginning to integrate them into your healthcare organization, Jamf and Jamf Pro make managing them simple and secure. 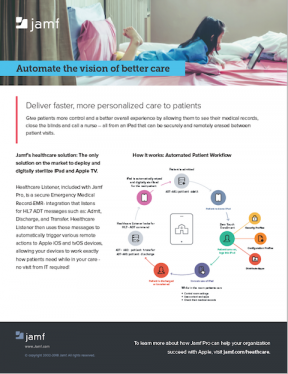 Find out how to leverage iPad and Jamf Pro to deliver the ultimate bedside experience for patients while in your care.